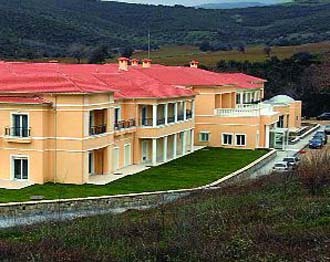 Thermae Resort & Spa is located in Platistomo, at a mere 29 km from the city of Lamia and 10 km from Spercheiada, hometown of the legendary Achilles. In the older days, on our privately owned land of 192 acres, two famous hotels used to offer hospitality to thousands of guests from Greece, Egypt, France, Italy and elsewhere attracted by the healing properties of the local hot springs. Today, keeping faithful to tradition, we are determined to revive the past glory of the area, while preserving its natural beauty unaltered. The ultramodern, four-star “Asklipios” hotel boasts 63 rooms and suites, beckoning with comforts for an unforgettable stay. 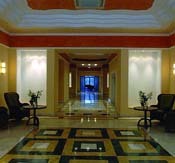 Each guestroom is appointed with luxury amenities, including automatic safety locks, soundproof windows, individually controlled heat, electric window blinds, window screens, Satellite TV, automatic light switches, mini bar, safe box, direct-dial phone, hair-dryer, digital scale, magnifying make-up mirror, ultramodern fire detector and ultramodern fire safety system. 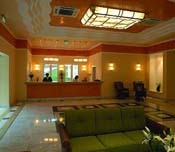 Furthermore, the recently renovated three-star “XENIA” hotel, located at a small distance from “ASKLIPIOS”, boasts 40 rooms and suites, offering lower rates with equally high quality services. In an idyllic location with trekking paths snaking through lush vegetation, age-old plane trees and running waters, we have combined body-care with entertainment, relaxation and an excellent array of dishes prepared with organic local products. 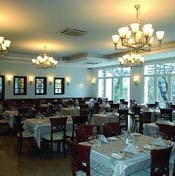 Facilities and services include a restaurant serving rich American breakfast, as well as light and delightful healthy meals prepared with fresh products; a warm and friendly piano-bar; business center; outdoor pool; poolside snack bar; children’s playground; games room; room service; babysitting free of charge and ample free parking. 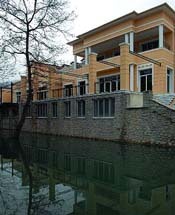 We have combined beauty with well-being (mud or seaweed spa treatment, spa chocolate therapy, Turkish bath with hot spring water, healing hydrogymnastics, facials, Jacuzzi, air massage, thin rain therapeutic showers and more) with therapy (relief from symptoms of neck pain, backache, sciatica, spondyloarthritis, muscle and bone aches, intestinal problems and gynecological problems among others). The resort boasts contemporary conference facilities for all types of events, from small meetings of 40 persons to large gatherings of up to 400 participants.